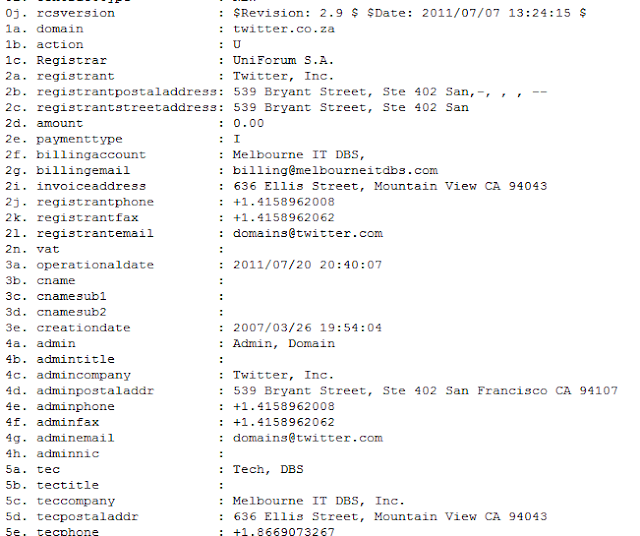 Perhaps Twitter is going more local into the ccTLD namespace as there is now a South African domain for Twitter: http://twitter.co.za . I don't think this is a new trend as it seems Twitter has been snapping up ccTLD domains and redirecting them to the main Twitter.com domain. The Twitter.fr redirects to the French Twitter website; Twitter.de redirects to Twitter.com, Twitter.jp redirects to Twitter.com, Twitter.co.uk redirects to Twitter.com, Twitter.nl goes nowhere or unregistered, Twitter.us goes nowhere or is unregistered, Twitter.me is probably unregistered or reserved, Twitter.co.ke is unregistered. I think Twitter, like Google, should register its domain across most of the global ccTLDs to give users a local flavour of the tool and also capture traffic from local search. Registering its domains on ccTLDs, as Google has realized, provides Twitter an opportunity to bond with the local users in various countries. Besides, these names can be snapped up by cybersquatters and getting them back is always a costly affair.